Fever without source in infants less than three months old presents a difficult diagnostic dilemma for ED physicians. Over the past 25 years several algorithms have been developed to help guide clinicians, most notably the Rochester, Philadelphia and Boston Criteria, in determining which infants require admission vs. outpatient management. These studies were designed published between 1992 and 1994 prior to the wide spread use of HiB and pneumococcal vaccines in children, maternal GBS screening and the development of many new biomarkers. 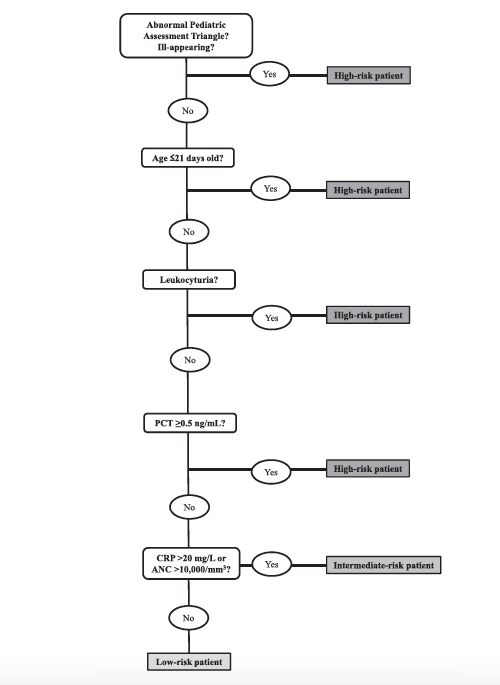 The “Step-by-Step” approach was developed by a European group of pediatric emergency physicians with the objective of identifying low risk infants who could be safely managed as outpatients without lumbar puncture or empiric antibiotic treatment. The algorithm was designed using retrospective data and this study attempts to prospectively validate it. How does the “Step-by-Step” approach compare to the Rochester criteria or the “Lab-score” method in identifying infants 90 days or younger with a fever of unknown source to be at a low risk of invasive bacterial infections? Infants 90 days old or younger with “fever without a source” defined as objective temperature of > 38C at home or in the ED without a clear source on history or physical exam, more specifically pulmonary exam findings or history of diarrhea. Detection of an invasive bacterial infection (IBI) defined by having a positive blood culture or positive CSF or non-IBI defined as infant with positive stool or urine cultures but without positive blood or CSF cultures. Multi-center prospective study including 11 European pediatric emergency departments (8 Spanish, 2 Italian and 1 Swiss). Data collected in 11 European Pediatric Emergency Departments therefore the use in other patient populations or settings other then dedicated pediatric EDs should be cautioned. The febrile infant can be a diagnostic/management challenge for the emergency medicine physician. The “Step-by-Step” approach to identifying infants at risk for potentially life threatening invasive bacterial infections has a 92.0% & 99.3% sensitivity and negative predictive value making it a reliable clinical decision instrument which can avoid invasive studies such as lumbar punctures. The study found that its sensitivity is primarily limited by onset of fever, specifically fevers starting <2 hours from presentation. When factoring this into detecting infants at risk for IBIs a sensitivity of 99.9% can be achieved. The Step-by-Step approach to assessing febrile infants has excellent sensitivity and NPV but should be used with caution in infants presenting within 2 hours of onset of fever and in infants 21-28 days of age.